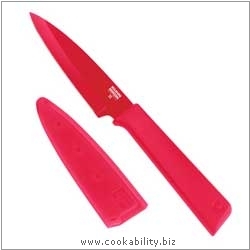 An updated range of vibrant knives that have a high carbon content Japanese stainless steel blades with colourful non-stick coating and most have a removable safety cover unless noted otherwise. These knives will take and hold a much better edge than a regular stainless steel knife. Fantastic value with a splash of colour.